Another super quick blog post, since I’ve finally received the last piece of a little puzzle that has been needling at me since I got hold of a batch of photocopied correspondence between Lord Grantham and his brother Frederick Robinson from Bedford & Luton Archives. I am still ever so slightly mystified, although I think I know what it means. If anyone else can help shed some light on the mystery, though, I’d be grateful. The Robinson brothers were prominent movers in Whig political circles, and their letters are full of references to the big names of political life. One of the families they were close to was the Townshend family, including Thomas Townshend, the future Lord Sydney, his wife Elizabeth Powys, and their growing family. Frederick and Anne Robinson, Lord Grantham’s siblings, frequently dined and socialised with the Townshends. On 4 May 1778 Frederick Robinson wrote to Lord Grantham: “I was at the Opera at night & supped at Mrs Townshends[.] 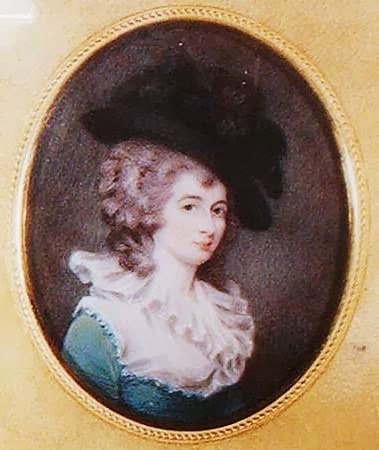 Georgiana [Thomas Townshend’s eldest daughter, born April 1761] is much grown though little alter’d[.] The second daughter [Mary Elizabeth, later Countess of Chatham, then fifteen] will be pretty”. Almost exactly a year later, Mary’s future husband John, Earl of Chatham paid the visit to Grantham in Spain that I blogged about in a previous post. After John had left Madrid, Grantham wrote to Frederick Robinson with further thoughts about the three “English” who had been his guests for over a fortnight: “I believe he [Captain Colt] & Conway found out new Acquaintances at Madrid, but Lord Chatham never went with them, & I would not swear that he is not in possession of a most precious Jewel”. I believe L[or]d Chatham is not in town, Nanny [Anne Robinson] met him at Tommy Townshend’s who gave him a dinner [upon Chatham’s return from abroad], I think it very probable that his Father recommended T[homas] T[ownshend] to him; if he has a mind to set that Jewel which you suppose him possess’d of very beautifully, he might consult Miss Mary Townshend. From which I gather that Lord Grantham guessed Chatham’s reluctance to visit Colt and Conway’s “Acquaintances” derived from some sort of attachment, and Robinson connected that attachment to Miss Mary Townshend, Tommy Townshend’s “pretty” second daughter. He certainly wasn’t wide of the mark, for four years later John and Mary were indeed married. Could it be that John already had a thing for Mary in May 1779, when he was 22 and she was 16? Could it be that he had had a crush on her even before he left for Gibraltar, since Lord Grantham seems to have picked up on it even before John’s return to England? And if so, isn’t that kind of sweet? Do you agree, or do you think Grantham was talking about something else?